Struggling with data at work? Wasting valuable time working in multiple spreadsheets to gain an overview of your business? Find it hard to gain sharp insights from piles of data on your desktop? If you are looking to enhance your efficiency in the office and improve your performance by making sense of data faster and smarter, then this advanced data analysis course is for you. If you have already sharpened your spreadsheet skills in Data Analysis: Take It to the MAX(), this course will help you dig deeper. You will learn advanced techniques for robust data analysis in a business environment. This course covers the main tasks required from data analysts today, including importing, summarizing, interpreting, analyzing and visualizing data. It aims to equip you with the tools that will enable you to be an independent data analyst. Most techniques will be taught in Excel with add-ons and free tools available online. We encourage you to use your own data in this course but if not available, the course team can provide. 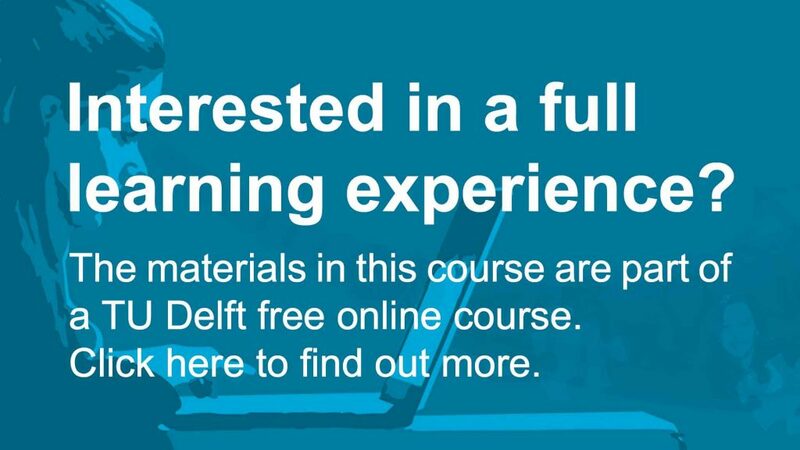 These course materials are part of an online course of TU Delft. Do you want to experience an active exchange of information between academic staff and students? Then join the community of online learners and enroll in this MOOC. This course is part of the Data Analysis XSeries. How to make data come to life with well-known types of visualizations such as line and bar graphs and new types of visualizations such as spark lines, contour plots and population pyramids. How to create dashboards in Excel based on live data that can meet managerial and business needs. How to connect data from different sources, such as the web and exports from your CRM, ERP, SAP or data warehouse. Some hands-on data science and how to use actionable analysis tools. Data Analysis: Visualization and Dashboard Design by TU Delft OpenCourseWare is licensed under a Creative Commons Attribution-NonCommercial-ShareAlike 4.0 International License. Based on a work at https://ocw.tudelft.nl/courses/data-analysis-visualization-dashboard-design/.